Texas Process Equipment is one of the foremost suppliers of specialty pumps and related process equipment servicing all of Texas and Oklahoma. We provide our customers with a full range of top quality, brand name products and services from our service centers in Houston and Dallas. Through a systematic common sense approach to business, active communication, continuous improvement, information technology, standardized documentation and integrated value selling, we are able to offer the lowest "total cost of ownership" to our customers. 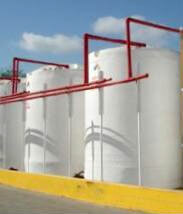 Learn more about Poly Processing's chemical storage tanks. Looking for new or to upgrade ANSI B73.1 sealed pumps? Consider sealless, emission-free, drop-in replacements with Dynapump LE B73.3 for a price comparable to a mechanical seal pump. Find out more about how TPE can take care of your fabrication needs.